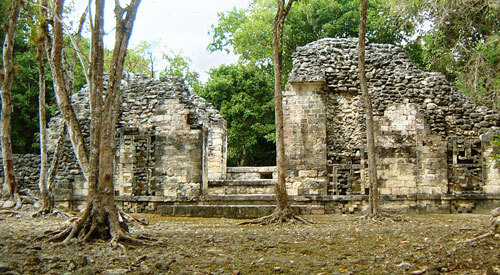 Chicanna Structure III is located on the north side of Group A. The lack of carved decoration and its poor state of repair make it an unremarkable sight compared to its neighbours, Structure I and Structure II. 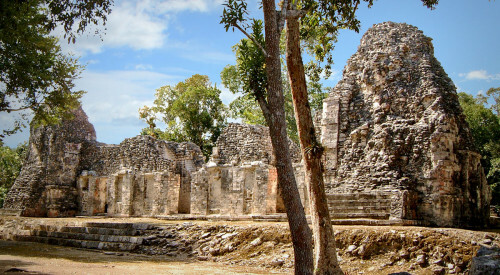 However, it is these dissimilarities that make Chicanna Structure III remarkable. There is also evidence that Chicanna Structure III was repeatedly developed throughout the Late Classic and into the Post-Classic Period. This tale of expansion during a time when most cities were in decline could make it one of the most important structures at the site. 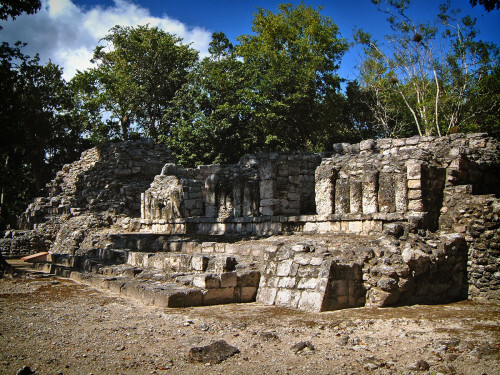 Archaeological investigations have shown that Chicanna Structure III was constructed in around 640AD. Additional rooms were added over the following four centuries and the original rooms were repaired and reconstructed. 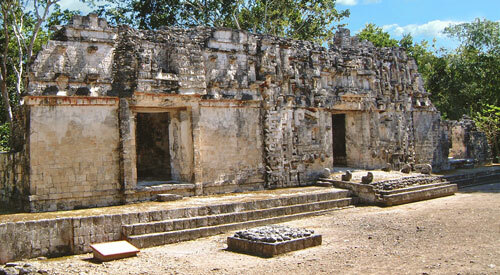 The last signs of development occur in around 1040AD, shortly before Chicanna was abandoned to the jungle. 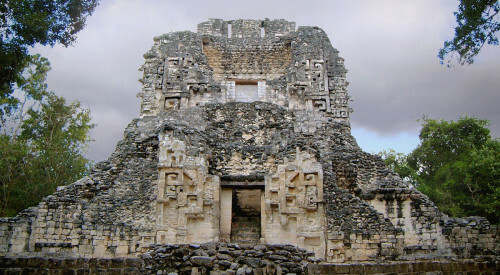 This demonstrates that Chicanna Structure III was of great importance and that its use grew throughout Chicanna’s history. The lower sections of wall that face into the plaza bear the remains of a pseudo-columned façade. 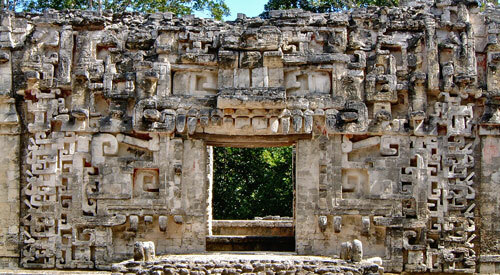 This style was commonly used in Puuc architecture that developed during the Late Classic Period (600AD-900AD). 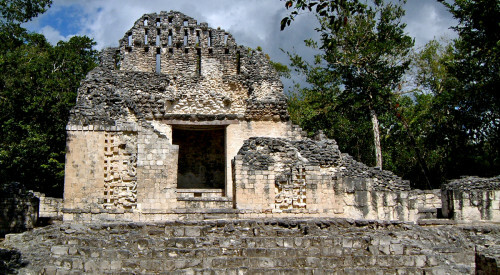 The façade of Chicanna Structure III also bears an uncanny likeness to Tikal Group G (named the Acanaladuras Palace on account of this style). 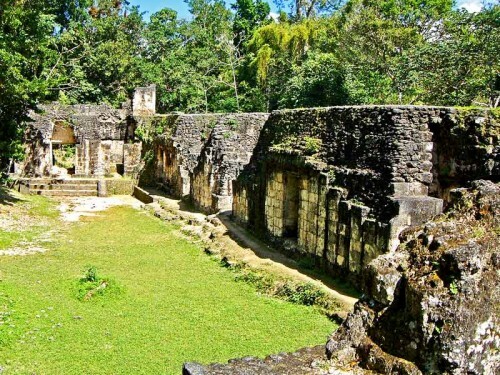 Tikal Group G is thought to have been built by king Yik’in Chan K’awiil in around 740AD, which coincides with the middle period of development at Chicanna. Another parallel is found in the Witz Masks that were discovered in both Tikal Group G and Chicanna Group A. These masks dictate a strong religious function for the buildings. 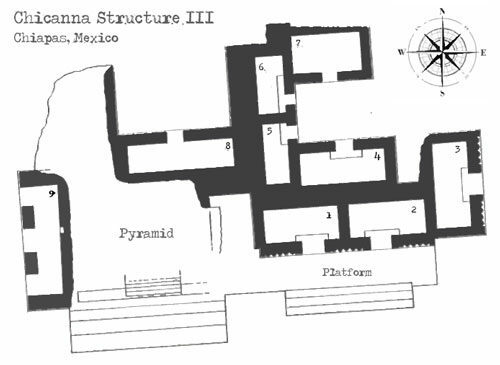 Chicanna Structure III features nine rooms and a small functional pyramid. The building’s position on the north side of the plaza of Group A means that it would have been accessed and viewed from the south. Only two rooms and the pyramid are directly accessible from the south. The remaining seven rooms are hidden away to the rear of the building. These additional rooms presumably played a supporting role in the ceremonies that took place on the pyramid and in the two rooms that faced the plaza. 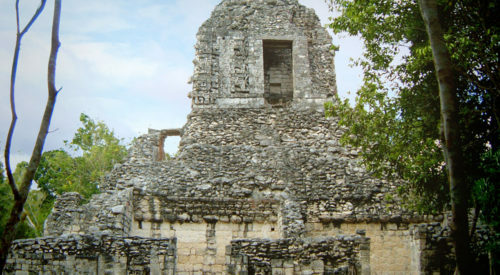 The small functional pyramid at the western end of the Chicanna Structure III is likely to have been hugely important. Like many Late Classic complexes, Chicanna didn’t build the towering pyramids that epitomise the Early and Pre Classic cities. In fact, this unassuming pyramid was the only functional pyramid at Chicanna. With so much religious activity focussed upon it, it is unsurprising that it needed to be repeatedly developed and repaired over the centuries.